Finding correspondences between two surfaces is a fundamental operation in various applications in computer graphics and related fields. Candidate correspondences can be found by matching local signatures, but as they only consider local geometry, many are globally inconsistent. We provide a novel algorithm to prune a set of candidate correspondences to those most likely to be globally consistent. Our approach can handle articulated surfaces, and ones related by a deformation which is globally nonisometric, provided that the deformation is locally approximately isometric. Our approach uses an efficient diffusion framework, and only requires geodesic distance calculations in small neighbourhoods, unlike many existing techniques which require computation of global geodesic distances. We demonstrate that, for typical examples, our approach provides significant improvements in accuracy, yet also reduces time and memory costs by a factor of several hundred compared to existing pruning techniques. Our method is furthermore insensitive to holes, unlike many other methods. This entry was posted in ACM Transactions on Graphics, Publication on February 18, 2014 by Gary. 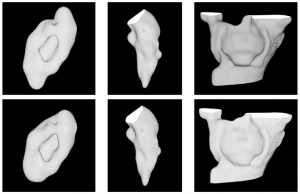 In this article, a new level set model is proposed for the segmentation of biomedical images. The image energy of the proposed model is derived from a robust image gradient feature which gives the active contour a global representation of the geometric configuration, making it more robust in dealing with image noise, weak edges, and initial configurations. Statistical shape information is incorporated using nonparametric shape density distribution, which allows the shape model to handle relatively large shape variations. The segmentation of various shapes from both synthetic and real images depict the robustness and efficiency of the proposed method. S. Y. Yeo, X. Xie, I. Sazonov, and P. Nithiarasu, Segmentation of biomedical images using active contour model with robust image feature and shape prior, International Journal for Numerical Methods in Biomedical Engineering, Volume 30, Issue 2, pages 232–248, February 2014. This entry was posted in Publication and tagged Computer Vision, Journal paper, Medical Image Analysis on February 9, 2014 by Xianghua Xie. 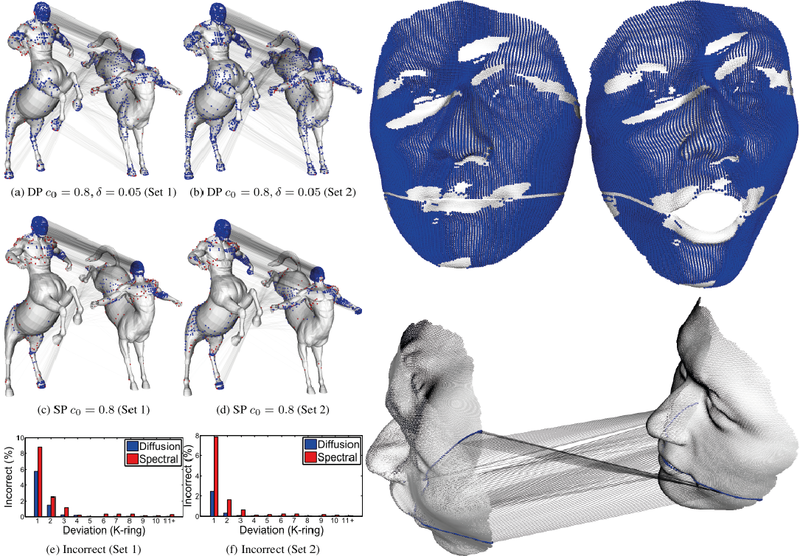 We address the two inherently related problems of segmentation and interpolation of 3D and 4D sparse data and propose a new method to integrate these stages in a level set framework. The interpolation process uses segmentation information rather than pixel intensities for increased robustness and accuracy. The method supports any spatial configurations of sets of 2D slices having arbitrary positions and orientations. We achieve this by introducing a new level set scheme based on the interpolation of the level set function by radial basis functions. 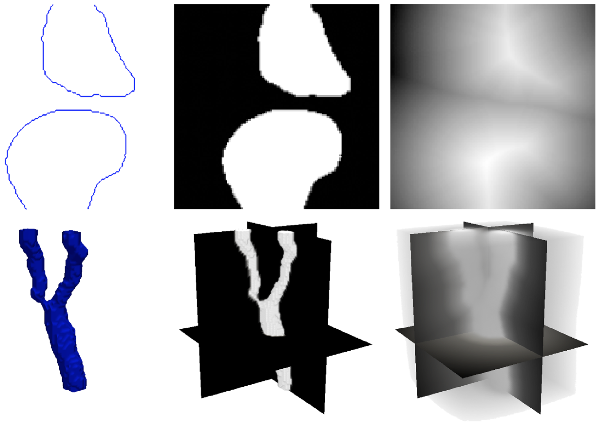 The proposed method is validated quantitatively and/or subjec- tively on artificial data and MRI and CT scans and is compared against the traditional sequential approach, which interpolates the images first, using a state-of-the-art image interpolation method, and then segments the interpolated volume in 3D or 4D. In our experiments, the proposed framework yielded similar segmentation results to the sequential approach but provided a more robust and accurate interpolation. In particular, the interpolation was more satisfactory in cases of large gaps, due to the method taking into account the global shape of the object, and it recovered better topologies at the extremities of the shapes where the objects disappear from the image slices. As a result, the complete integrated framework provided more satisfactory shape reconstructions than the sequential approach. A. Paiement, M. Mirmehdi, X. Xie, and M. Hamilton, Integrated Segmentation and Interpolation of Sparse Data, IEEE Transactions on Image Processing (T-IP), volume 23, issue 1, pages 110-125, January 2014.